Quantum mechanics is the key to modern physics and chemistry, yet it is notoriously difficult to understand. This book is designed to overcome that obstacle. 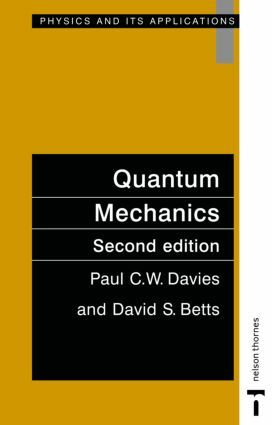 Clear and concise, it provides an easily readable introduction intended for science undergraduates with no previous knowledge of quantum theory, leading them through to the advanced topics usually encountered at the final year level.Although the subject matter is standard, novel techniques have been employed that considerably simplify the technical presentation. The authors use their extensive experience of teaching and popularizing science to explain the many difficult, abstract points of the subject in easily comprehensible language. Helpful examples and thorough sets of exercises are also given to enable students to master the subject.